The indoor play area for kids with special needs – exciting updates! 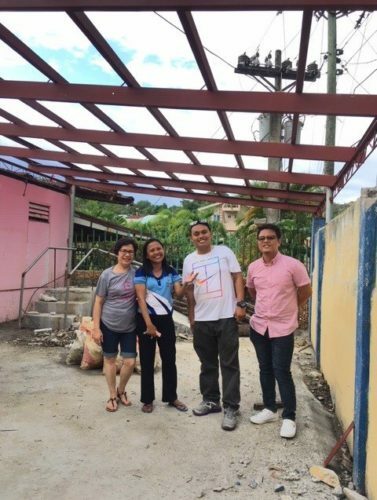 I’m way beyond ecstatic to share with all of you the latest updates on our project: the mini-therapy area or the indoor play area for kids with special needs who are enrolled in the Special Education program ( RECS-SPED ) at the Romblon East Central School in Romblon, Philippines. This mini-therapy area is dedicated only to these kids. It is at the back of their resource room and only these kids will have access to it, plus their teachers and maybe the parents or caregivers. We started from a dream and a vacant lot! 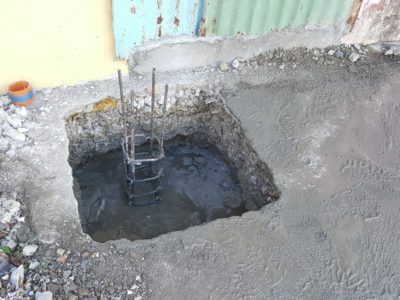 Construction started in December 2017, almost 13 months ago. 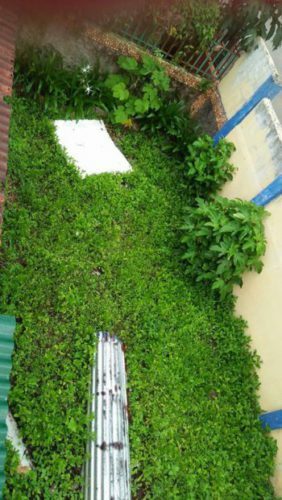 This was how the vacant lot looked before- just an idle space waiting for something to blossom. Please read here for more information on how we started the project. We only had big goals then, but no finances. So, we brainstormed ideas on how we could raise funds. 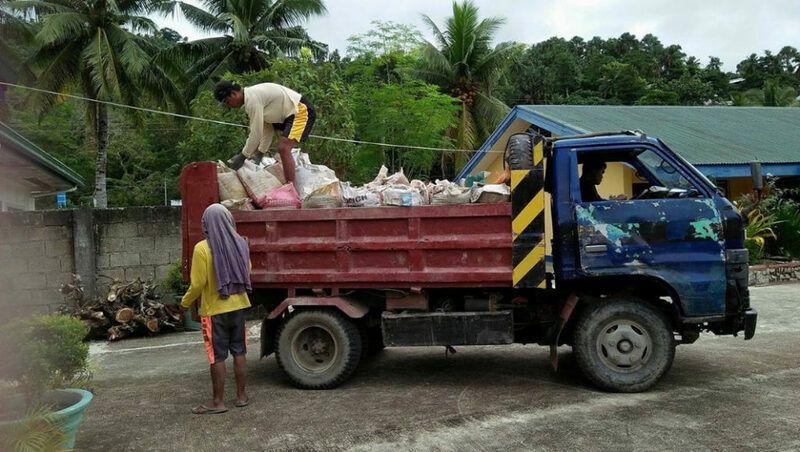 Two major fundraising were done locally in Romblon, Philippines to help out with the expenses plus a much bigger and still ongoing fundraising at Go fund me, which we started during my birthday 2 years ago in October 2017. Click the image below to view the page. 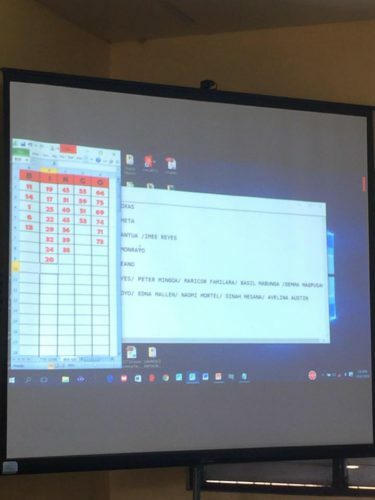 The very first local fundraising was done last year on January 2018 with the ” Bingo Social,” where teachers, parents and the community enjoyed playing the bingo and hoped that their cards will fill with stones with the called numbers and follow the pattern that was announced each time. 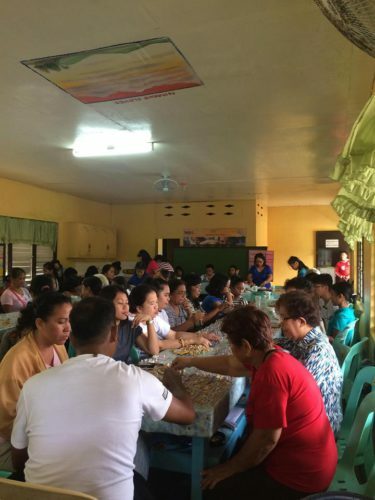 There was tremendous financial support from the townspeople including the teachers, parents, and the whole community, as well with cash donations in response to the solicitation letters that we distributed. Our most recent fundraising was last month- the Christmas show where the special kids showcased their talents in dancing, singing, modeling and acting. We had also silent auction and door prizes for this event. Solicitation letters were sent out as well to the community, and again, with overwhelming response. Click here to read the full post about the Christmas show. 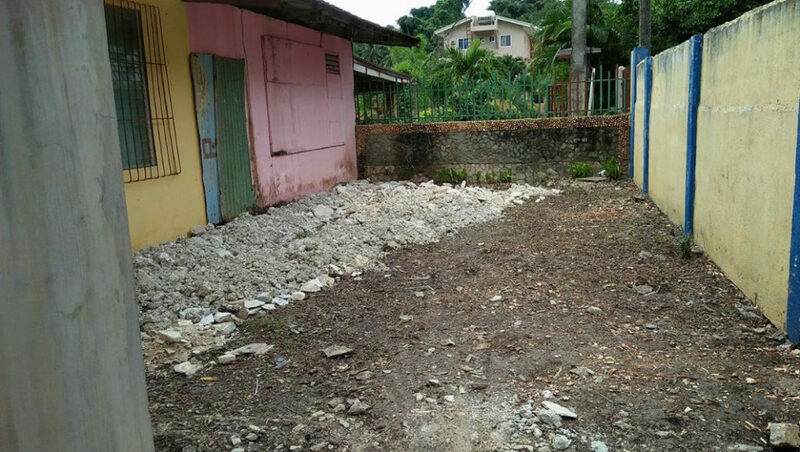 Building started in December 2017 after we got substantial amount from the Go fund Me page. Workers prepared the vacant lot and eventually got busy constructing the flooring of the indoor play area. We really got excited and very hopeful that finally we are living our dreams and somehow we will have something to offer our children with special needs to enhance their social and motor skills. Indeed, if we strive to do something and don’t hesitate to ask for help, nothing is impossible! And the workers did really good in their tasks and worked fast. 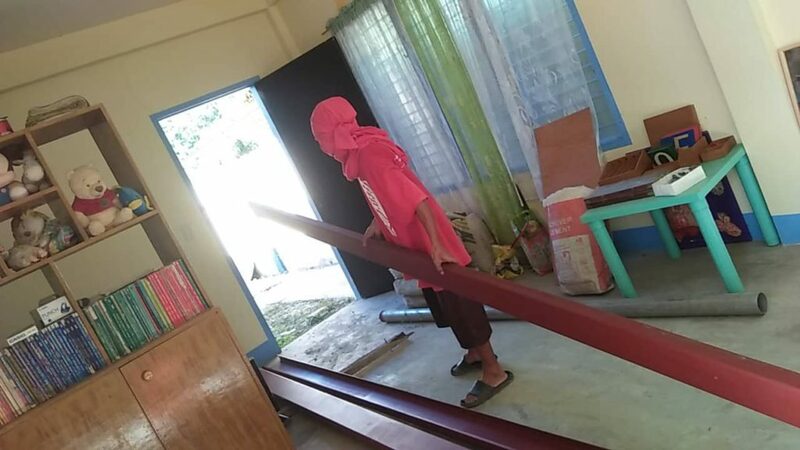 All the while, the SPED teachers were there to supervise and observe the ongoing project while continuing their jobs to teach the students with their academic needs. After a few weeks, look at what they have accomplished! At this point of the project, we got more excited and hopeful that it will be done soon. The flooring was done, so what’s next? Unfortunately for several months, the project stopped for lots of reasons- from the teachers being busy with school activities and seminars or conferences, to summer vacation, to not being able to find suitable and dependable workers, to name a few. But our excitement was still there. 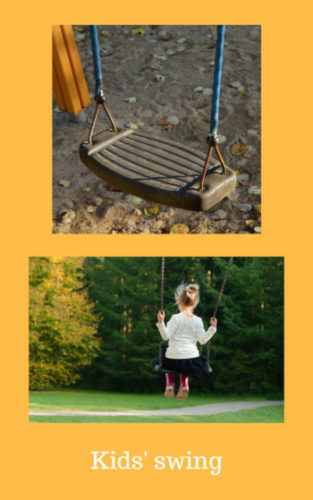 During this quiet time with the project, I started to build this website, panggataikaw.com, to raise more awareness that special kids are part of our community and need our love and support. I also wanted to reach out globally for more donors. If you are one of those with generous hearts, please donate through our Go fund Me page here. As of last month, the work was again actively ongoing. 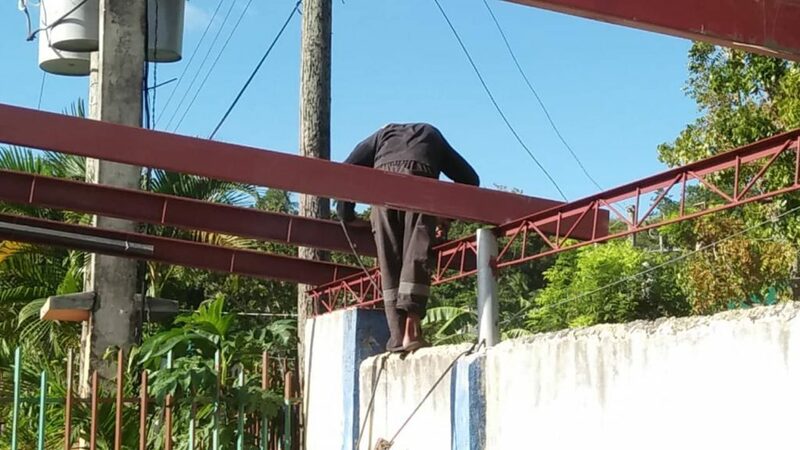 Posts were put in place in preparation for the roofing. Funds that we collected in the ” Bingo Social ” and the extra from the “Go fund Me ” page were all put into use. 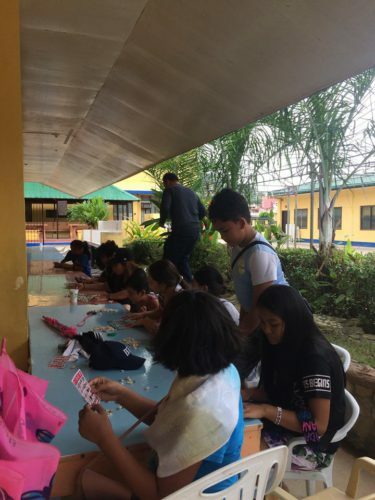 While the workers were busy at the back of the resource room, the SPED teachers were all hands preparing for the ” Christmas show,” the latest fundraising done last month on December 15, 2018. Can you imagine that in just a little more than two weeks, these roof foundation were put in place? 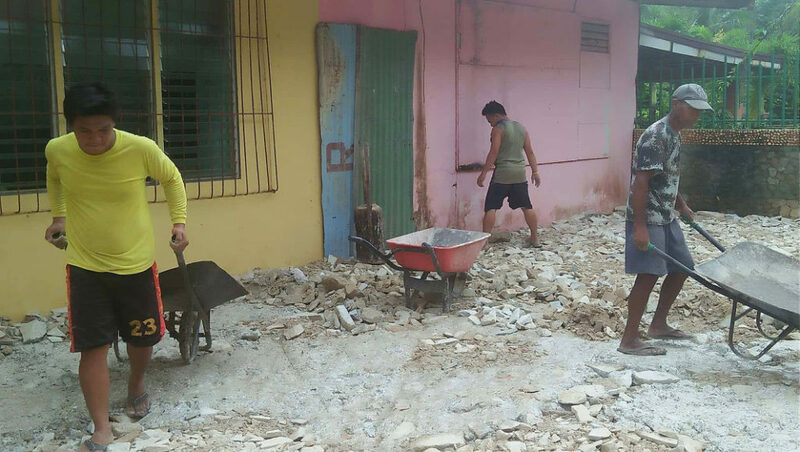 We are so happy that our efforts and your donations are all taking shape! 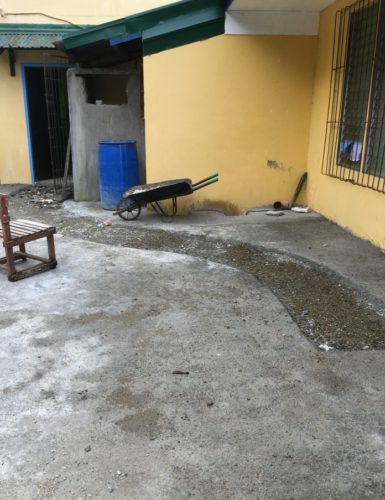 We are all excited to continue what we have started and we feel that soon, we will be seeing our special kids play and romp in this mini-playground slowly being built just for them. Again, our big thanks to all the donors and supporters, from the local fundraising and to the Go fund Me page. Our project looks almost done with all your help, but we still need more donations. Please consider sharing your blessings through our Go fund Me page. Then we will start buying play equipment like these. Would you believe we can now vividly hear the laughter and the squeal of the kids? We imagine our children with Down Syndrome develop their best motor skills! And the children with physical deformities and those struggling with social and communication skills will get to bond with their classmates and eventually show improvement in their gross motor and social skills. And they will always look forward to being in school everyday because during recess and after school, they can play and share giggles and bouts of laughter with their friends and classmates. And of course, your support is still much appreciated. I have always felt that generosity is all around us. We are always ready to support worthwhile endeavors. Our hearts are always open to share our blessings. I’m sure we have all experienced pure joy when we give. And blessings come back a hundred fold. If we have stable jobs, complete family, good health, happy relationships, giving to people in need is so easy to do. It’s our way of thanking GOD for all these graces-SHARING because our BLESSINGS are bountiful. Our children with special needs at the Romblon East Central School in Romblon, Philippines say THANK YOU for pouring and sharing your blessings to them! We have an advertising relationship with the stores/ business  we link in this post. We'll earn a commission when you shop through our link with no added cost to you. Are you willing to help the special kids reach their fullest potential? Please share your blessings and support our ongoing project by clicking here. Live your dream. Start your website and reach online success with Wealthy Affiliate. Click the image and see you inside. It is really great to hear the kind of initiative you guys have taken here. I’m really happy to see that there are still people who are giving back to the community. I would love to thank the donors and supporters for this cause. I would also love to contribute for this nice cause. Thank you so much for sharing this and giving us an option to help. Right, lots of people are touched by worthy causes like our indoor play area for the special kids. And future projects. Thanks for your nice comments and for the help. Truly special kids are there ready to embrace our love and support. This indoor play area is what we can offer for them to develop their motor and social skills. We hope to complete our project this year. I’m totally knocked out by this website. What a wonderful project and what a showcase for what can be done when a few generous people put their minds to it. The thing that impressed me (besides being able to visualize the fact that a chunk of vacant land could be turned into such a positive outcome for kids with special needs) was the multiple ways that were engaged for fund raising. Bingo. Who doesn’t love Bingo? It’s a great fund raiser and the photographs showed what a good time was being had by everyone. A win-win. Solicitation letters aren’t necessarily easy to do and require careful crafting. But if they reach even just a handful of generous donors can make a huge difference. And finally a GoFundMe page. How brilliant. I’m going to go and have a look at it now. So worthwhile and so well done! We believe that if we put out our needs, lots of people respond favorably. And that’s what happened in our place with Bingo and the Christmas show, plus the Go fund me page. Of course, not everybody gives out support, but most do. All our efforts were not wasted. Thanks for helping us and the special kids. Hi, This is a wonderful project that you are taking on. I have little knowledge of the down syndrome and what exactly the kids need to still have an as normal life as possible, but I may be able to help you on your fundraising campaign. 1. You can target your audience/followers. Meaning you can find people who are concern about this issue and willing to donate. 2. You can have an international audience as well. Through your “non-profit” Facebook page you can target people or even other organizations involved in Down syndrome and show to them through your posts what you are trying to do, what are the challenges you are facing and what are the help that you need to overcome the challenges. 3. You can directly ask for donations using your Facebook page. Hopefully, that helps on your “fundraising” issues. Thanks for your advices. I have a facebook page https://www.facebook.com/groups/Pangga.ta.ikaw/ but I have used it only to post my articles not for fundraising. I will look into that. Kids with Down Syndrome have different levels of mental retardation that require timely support and intervention for them to develop to their fullest potential. Appreciate your willingness to donate. Yes. That’s a very good and reasonable thing to do. I mean, many handicap children today that can’t have a normal play life simply because there are no places where they can enjoy games. It’s great to have an indoor play area for kids with special needs. Thanks for this. I appreciate. I really love the ideas and brains behind this project. I must appreciate everyone who has one way or the other contribute to this project because the kids really deserves this. I will strongly be contributing to this project and I must thank you for bringing this to my notice. Thanks for your nice words about our project and for planning to help. I am glad with the good work you are doing to give kids with special needs a reason to be hopeful and a second chance at life. It takes great determination and courage to carry out such a project in the midst of little financial resources.I believe nothing is too small or too great to support projects like these. God will surely reward your efforts. Other than financial assistance, what other form of assistance can interested ones offer your charity? Plus, have you also tried fundraising on other platforms such as Indiegogo? I’ve always believed that worthwhile projects are amenable with the support of generous people. And these people are out there anywhere. With God’s guidance and the full support of donors, we will finish this project in no time. Locally, we also accept donations in kind, like materials for building the indoor play area. I have not tried indiegogo, but will try to look into that. This kind of initiative has really blessed my day. It’s good to know there are still good people who are genuinely interested in helping out other people especially people with special needs. I like the way your organisation has turned a dream into reality putting a smile on the faces of this kids. Can I get a fund from the go fund me page from Africa?? I’m confused with your question. 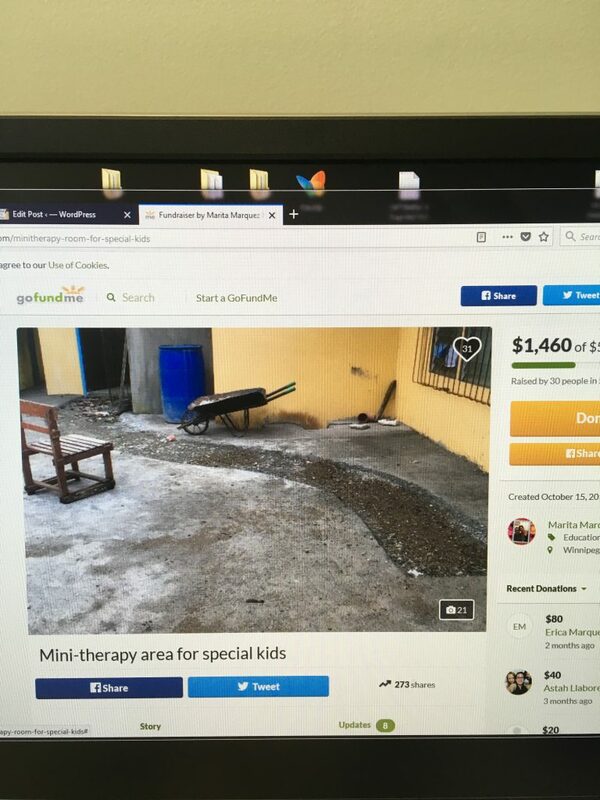 If you’re asking if you could donate from Africa to our fundraising through the Go fund me https://ca.gofundme.com/minitherapy-room-for-special-kids I’m sure you can do that as long as you will be using a valid credit card. Thanks for the nice comments. Happy to know that learning our passion blessed your day. What a great idea to have that will last ages to come we need to accept that kids with special needs and require love just like everyone else by doing what you guys have achieved that is more than people might have though you still have alot to do for this kids and for the love of God you do it and achieve Even more than you could imagine keep doing the good work Doctor it is worth it and blessings will come your way. Thanks for appreciating the work that we do for the special kids. Loving and supporting them is my lifetime mission. What a wonderful site and wonderful journey you presented through this article on your site. You go into details with the steps to complete this lofty project, and my heart and prayers go to you for all your hard work on behalf of these wonderful children. How beautiful! I will have to check back often to see what else you have going on. Hats off to you. Hello Marita,This is a piece of awesome information that you have provided. I truly believe that the special needs of children need some form of pampering and an indoor play area for the kids is a great idea. 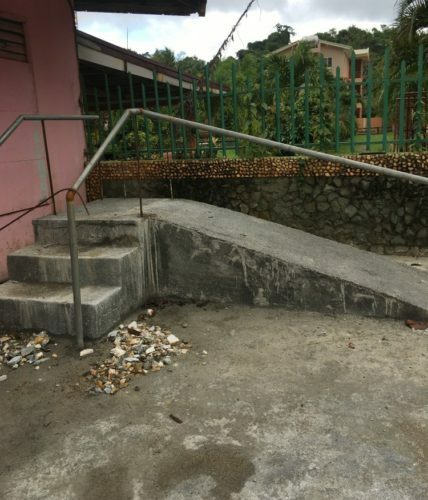 Congratulations on the initial construction that took place which was shown clearly on the images. Keep up the momentum that you have set. We are close to completion with the indoor play area for our special kids, but we still hope some generous donors would offer financial help to cover the finishing touches and the equipment. This is really a great way to give back the community. Many time kids with special needs are overlooked which is not right and it breaks my heart. All kids deserve love and a happy childhood and you and your team are very amazing for making that happen. Great article, keep up the good work and continue spreading love. Thanks for the nice comments. You are correct, kids with special needs are just like anybody out there who need love and support. Pangga ta Ikaw will always be here for them. Our indoor play area will soon be dedicated to them. Hi Marita, I must commend your efforts on this project. 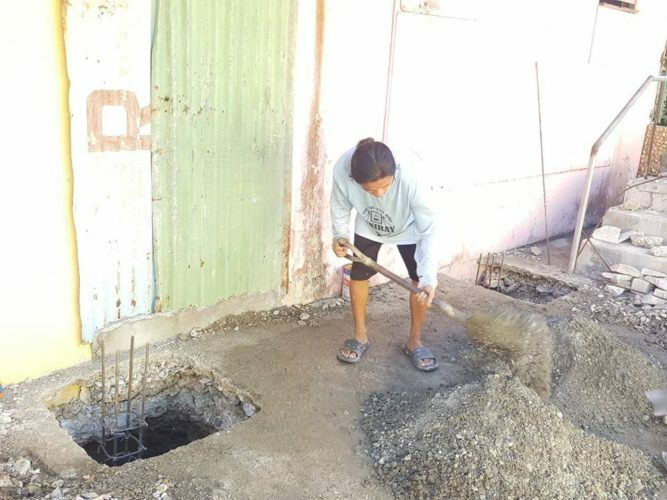 Having the courage alone to take up such a project when you are not even sure where the funding will come from, shows that you can do more when given proper assistance. It gives one satisfaction seeing children with special needs being happy and participating in different indoor games. The smiles alone plastered on their faces makes all the difference. You have been amazing, right from the starting of the project, the funding method down to this stage. I can only hope that more funds will come for this great project to be accomplish. It is really a nice initiative, keep it up. I’ve always believed that a worthwhile project is possible when you plan ahead and be positive that it will prosper when you ask support from generous donors. Prayers help a lot as well for any endeavour to succeed. Thanks for having faith in us. I admire your having a passion for this. Truly amazing because there are only few people who will spend time in cause-oriented projects like this, most are just contented working for a living and earning money. And this website of yours? This is a good extension of offline activities which characterized most successful websites. You know, there are a lot of people who think a website or online business exists only on the Internet, but this type of website like yours, is a good extension of your offline activities. Keep it up, and keep doing good for our country and for the children with special needs. God bless you. Thanks for the nice comments. This is a lifetime commitment for me and my family. Thanks for your nice comments and good wishes. I’ve always believed that if you put God at the centre of anything that you do, everything will just fall into place. Previous Previous post: The Christmas show-our special kids in action! Next Next post: Special needs homeschool….can my child learn?